The Bauer Supreme One100 Goalie Stick is the top of the line goalie stick from Bauer. To provide the performance that one would expect from Bauer, they have used an INNEGRA™ fiber wrap in the paddle and blade. Bauer has also used a reinforced aerospace core in the paddle of the Supreme One100 goalie stick. This combination enhances the durability of the stick by providing additional stiffness, but also helps to reduce the overall weight and vibrations of the stick. The One100 goal stick also uses an ergonomic paddle design that allows the stick flat face and remain lightweight. Bauer has used a tacky, ribbed design on the shoulder of the One100 goal stick calling it the "Control Zone." As the name states, this feature increases the control with the stick by ensuring it doesn't slip out of the hand. 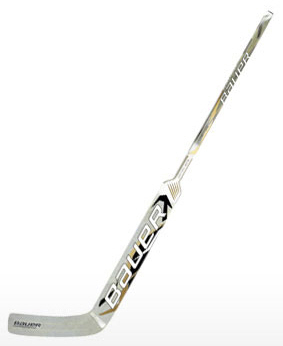 This goal stick also utilizes double concave walls in the shaft allowing for excellent feel with the stick.